Well, the good thing about bringing home this collection is that I have knocked off three titles from 1001 Books in the space of an hour, because there are two other short stories honoured by inclusion in the list. 1001 Books tosses around epithets such as gifted writer; incredible legacy; and with significance as indisputable as artworks so diverse as Borges’s tales, The Name of the Rose, and The Usual Suspects. If you are a fan of the horror genre, you will presumably agree, but these stories just made me laugh. The Fall of the House of Usher (1839) features a narrator who is summoned to the melancholy House of Usher to provide aid to his childhood friend Roderick, who with his dying sister Madeline are the last of the line. All the now familiar tropes of the horror genre are there, (Gothic house, dark lake, dreary red velvet curtains etc.) but I suppose they were radical and new when Poe created them. She dies, they bury her in the dungeon, the men read gloomy poetry, and Roderick’s superstitious forebodings come to pass. The Pit and the Pendulum (1843) is IMO a more convincing story. The narrator has been imprisoned alone in a dark dungeon by the Spanish Inquisition in Toledo and is subjected to a string of horrors signalled by the title, each one more sadistic than the last. There is a deep pit into which he nearly falls in the dark; he is bound onto a platform where salty food is within reach but water is not; there is a pendulum with a sharp blade cunningly positioned to come slowly closer to his bound body; there are plentiful rats and there are walls shifting towards him to force him into the pit. But of course the reader knows that he escapes, because in paragraph one he compares the white lips of the judges who condemned him to the white paper on which he is tracing his words. Still, the story works quite well: we see his desperate plight, his dawning comprehension about what is happening and his appalled recognition that each time he escapes he has fallen into a predetermined trap which is designed to drive him mad. The Purloined Letter (1844) is a ‘pioneering detective tale’ which features a pompous gentlemen called Dupin and his not-quite-so-smart offsider mocking the thick-witted Prefect of the Parisian police who can’t solve the crime when the solution is right under his nose. This story predates the appearance of Sherlock Holmes in A Study in Scarlet by forty years, and it shows its age in the prose style. Probably available free at Project Gutenberg. I reread many of Poe’s stories a few years ago and thought most did not hold up well. Yet when I read them as a young teenager I really felt the horror, and so must have his readers when they first appeared. Too many dark mansions, dusky draperies, dead and dying bodies, incipient madness. The best of the lot is still A Cask of Amontillado. Hi Nancy, thanks for dropping by:) You make a very good point: the books we enjoy when we are young are not the same as the ones that appeal when we are older and more experienced as readers, and there is nothing wrong with that! 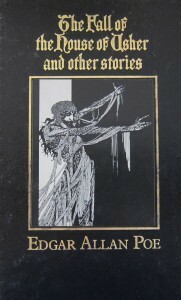 I got my Edgar Allan Poe Stories 50 years ago this xmas and loved and re-read them for years. I’m not sure I ever thought they were ‘horror’ but they conveyed a particular atmosphere, mostly through the rhythms of the writing I think. And yes A Cask of Amontillado is the best. Drat, two recommendations for Amontillado – I should have read that one too before I took the book back to the library. I love the old Vincent Price film versions of Poe Can’t resist the tongue-in-cheek campiness of them. Now you are taking me back. A local TV channel used to run a series called Creature Features with the old films. I watched with my son who was then about 12. We saw Dracula, The Wolfman, Frankenstein (of course) and variations of the same. The Wolfman was particularly notable, an early special effects film in which Lon Chaney gradually evolved from a man to to werewolf.